Nobody loves the Copperhead action figure. End result: I had to kill all three of them. Sometimes it’s best. Also of note, the Mary Marvel figure in the set is named “Mary Batson,” because of, well, you know, the whole Marvel Comics thing. (Like that set of SHAZAM figures from DC Direct a while back, with “Captain, Jr.” an’ all). Plus, if you get all the figures, each package has a piece o’Darkseid that you can assemble: you can see some of the figures and the fully-assembled Darkseid here. The figures come with some pinback buttons featuring oddly-cropped cover images of classic, and not-so-classic, DC Comics (though the one I saw of this cover wasn’t too bad). Those pins weren’t nuthin’ on the pins Employee Aaron and I made a while back. Yup. Those were some good pins we made. Too bad Aaron had to die. Oh no! I have been killed by Mike! B) yelled “There can only be one!” afterwards. I misread the title. I thought it was the Coppertone Action Figure with a girl…well, I was wrong. Why in God’s name would anyone make a Copperhead toy? Coulda been worse: at least you didn’t have to explain what a Hellgrammite was. 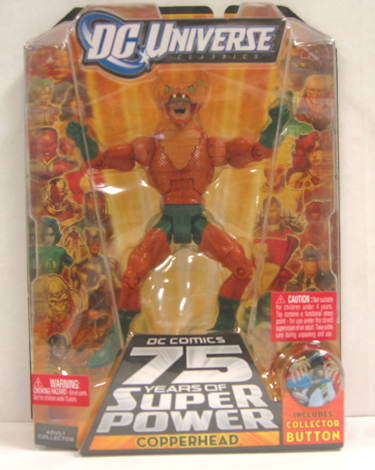 DC Universe Classics has been an amazing toyline, if only for the Fourth World characters being over-represented. (You can tell the love they put into Forager, Steppenwolf and Mantis.) And Copperhead looks just fine next to their wonderfully garish Killer Moth. Sadly, no Swamp Thing, nor any plans that I know of for one. Does that action figure come with a bonus Kate Spencer Manhunter figure with real exploding head action? He’s actually pretty cool, I like him in the comics.